We hiked Troll Falls this weekend and were pleasantly surprised at how easy it was. We let the older kids ride their run-bikes, since it really helps extend their range, and pushed the youngest in the Chariot. I also remembered to keep my expectations low, and to let the kids lead. With this set up we were 38 min from car to Falls. Two Jack Lake in Banff is a fantastic place and the stars really cooperated for me the other night. 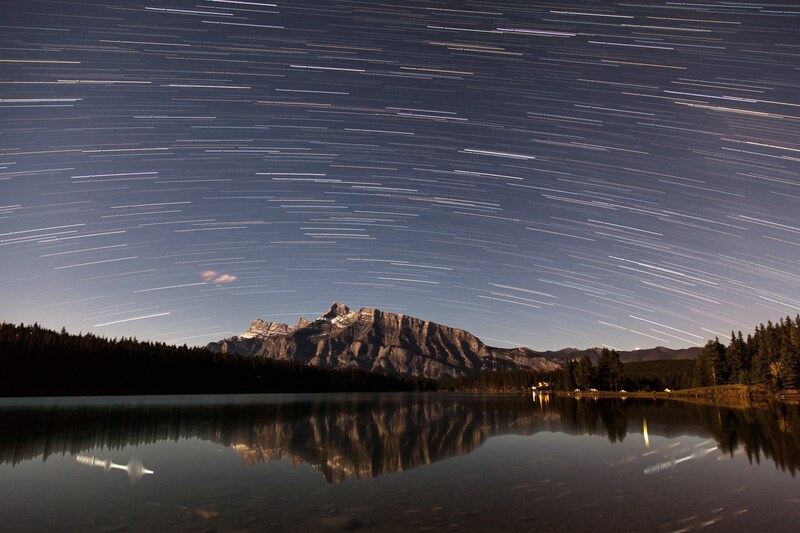 These star trails are a result of an hour-long exposure. Shortly after that the moon came up and washed everything out. With this week’s poor air quality rating and the repaving related traffic snarls on Scott Lake Hill we chose to avoid getting stuck in traffic on Hwy 1 went to Bragg Creek instead. The ratio of outdoor time to driving time must be greater than one. Example: if it’s a 1 hr drive to get somewhere we have to be outdoors for at least 2 hours to make it worthwhile. With our current nap schedule it’s challenging to reach more distant places. 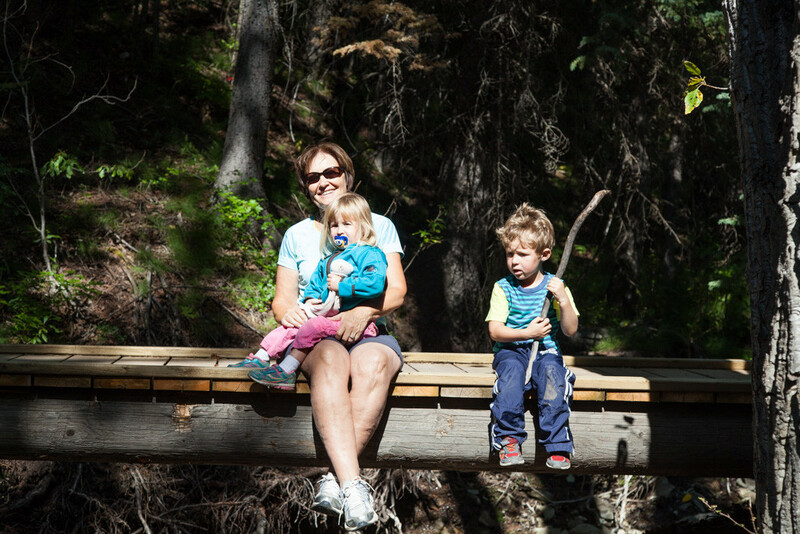 We took the kids out for a nice easy hike along the Beaver Flats Interpretive Trail. 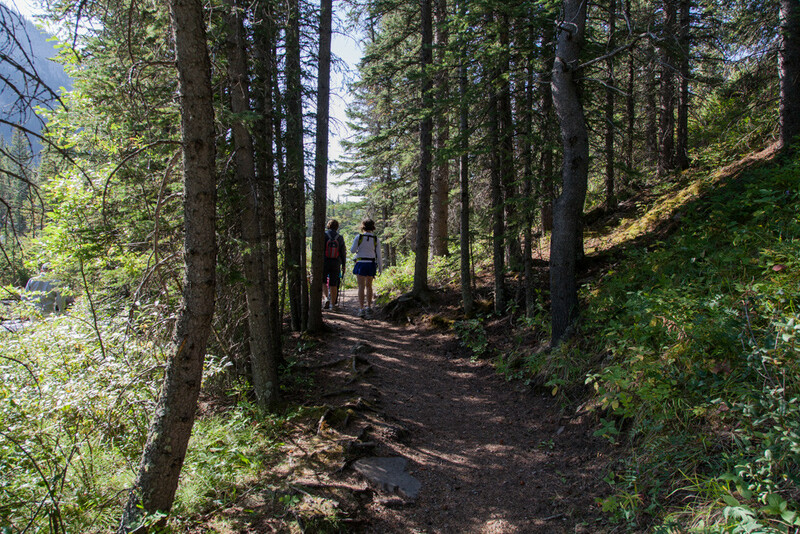 The trailhead is a small paved pull-off just past the Elbow Falls parking lot. 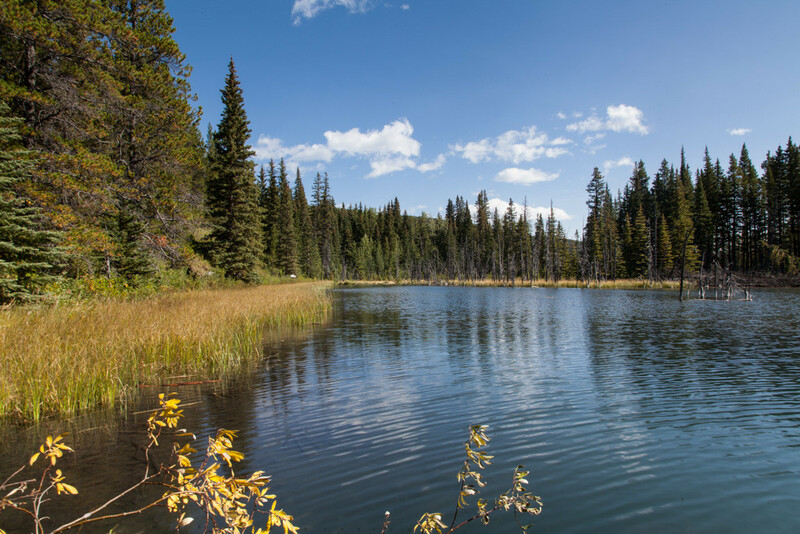 From there the well built trail drops down towards the river and follows along a marshy fenland near the Elbow river. The trail is well maintained and critical bridges have been rebuilt after the 2013 flooding that wiped out a huge amount of infrastructure in this region. Like our trip to Upper Kananaskis Lakes we brought the Chariot again and pressed it into service as pack-mule and rescue-vehicle for tired kids. The Upper Kan trail was challenging for the Chariot with roots and narrow sections, and by comparison the Beaver Flats trail was easy terrain for our mule. 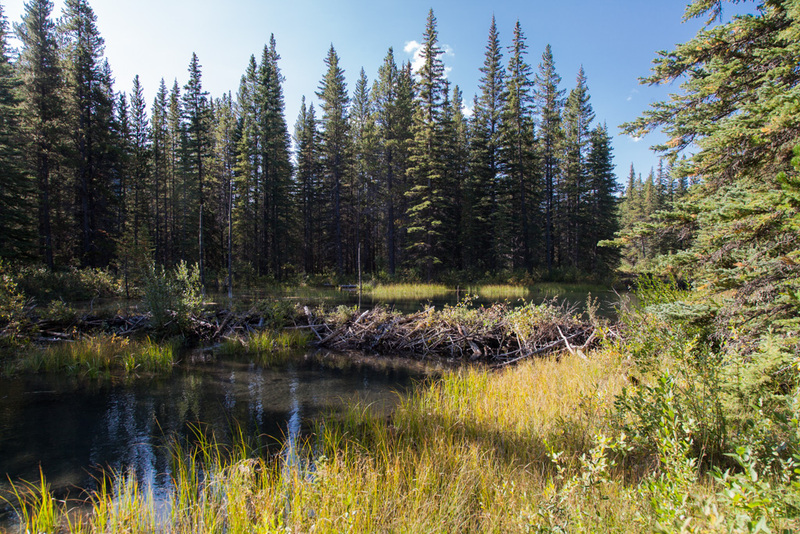 The best part for the kids was the series of beaver dams along the way. They enjoyed looking for beavers (we only saw a frog and some ducks), standing a beaver’s house, and throwing rocks in the water. 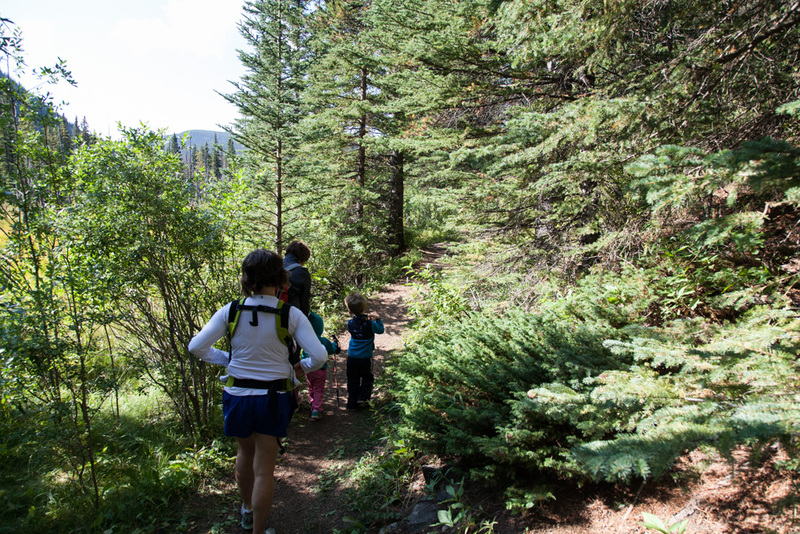 The trail ends at the Beaver Flats campground, conveniently right near some outhouses too. We turned around there and followed the trail back all the way back to the first bridge where we ate lunch. In the end Logan (3.9 yrs) and Riley (2.5 yrs) both hiked the whole distance and there was no need to use the Chariot for them. Emily (5mo) rode happily in the Ergo for half the trip then in the Chariot for the other half. Total distance according my Gem Trek map is 1.3km one-way, however measured on Google Maps it shows only 950m. Either way, the kids did 2 km or more without whining or crying and it was a fun morning. One of the best parts of this hike is that it was very low stress. It doesn’t take long to get there, you don’t need anything in particular for it, and it isn’t a committing trail. Another important aspect is that I had already lowered my expectations for the day and wasn’t anticipating a summit or a lot of distance. This really helped frame the day as a chance to be outside, to play in the mountains, and to create a positive experience for everyone. One of the hardest lessons for me to learn about hiking or camping with small kids, is that I need to substantially lower my expectations. Our trip last year to Sunshine Meadows was a good example of that. We did a lot of prep for the trip: had our packs ready the night before, clothes, boots, and snacks all lined up; got up early to catch the bus from Sunshine; pumped the kids up for a fun day in the mountains and how we’d hike all the way to Rock Isle Lake. Then we get off the bus, start moving, and 100m later the kids want snacks and a break! Super Frustrating! This was the first moment when it became fully clear to me that we needed to redefine what it mean to have success int the outdoors with kids. Prior to having kids “success” usually meant blasting out four summits in three days or getting up at 4am to climb a snowy couloir. While I am confident that we’ll have those days again they aren’t the kind of adventures you can have with a kid under 4. 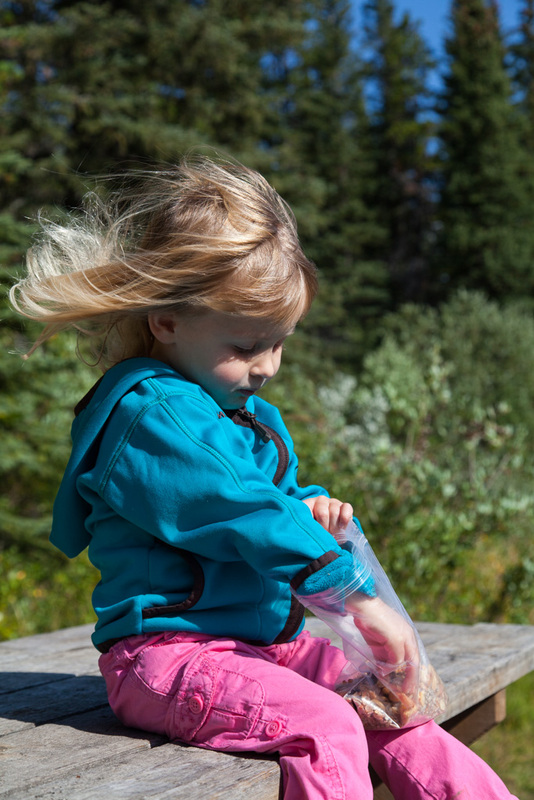 As our kids grow in age, skills, and ability we can keep refining and adjusting our definition of success outdoors, but for now this works for us. One of our emerging family traditions is the Family Walk Time. It actually started when Jamie and I were still living in Denver as a way to stretch our legs after dinner and stay active on days when we weren’t out climbing mountains. Regardless of the weather we would head outside for an hour-long walk through our community. There was no destination, no time to beat, and no minimum distance to make it count; the goal was just to get outside, be active, and spend time together. Now that we’re a family of five (with three kids under 4) we’ve adapted the tradition to include all members of our family. At first we would push the kids in the stroller, then the Chariot when they grew too large. Logan (3.75 yrs) and Riley (2.5 yrs) are now masters of kick-bike and prefer to ride their bikes rather than walk. We still explore our neighbourhood and take great advantage of the wonderful green-space that our community has to offer. We regularly walk/ride for thirty minutes or more with stops to play in the trees, the grass, or to yell into a large storm-water drain to hear the echos (the kids mostly do the yelling…). 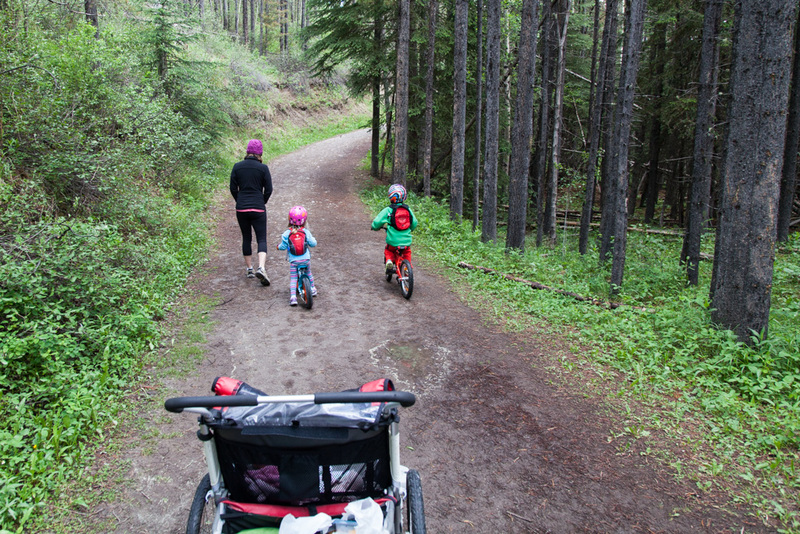 With two adults, two kids on kick-bikes and one kid in the stroller the goals of Family Walk Time are still the same: spend time outside, be active, and spend time together as a family. The recent announcement by Google that they are reorganizing into a holding company called Alphabet which will hold operating companies for each of their products struck me for a number of reasons. In particular the letter that CEO Larry Page released detailing the reasoning demonstrated a number of key things that keep Google successful. In the letter Larry outlines that they set out with the intention that “Google is not a conventional company. We do not intend to become one.” The letter demonstrates to me that Google is not a conventional company. It is not a stuffy, formal letter written by lawyers or a PR firm designed to be as inoffensive as possible while still raising the share price of Google. It is a real letter, written by real person, expressing their real feelings, in natural language. He says things like “Sergey and I have been super excited about his progress and dedication to the company” and “Susan is doing a great job as CEO” and “We are still trying to do things other people think are crazy but we are super excited about.” Apparently if Larry Page is one thing, he’s super excited! Servant leadership is the concept that the leader of an organization is there to ensure that their people have the tools, empowerment, and opportunities under which to perform their best. A servant-leader focuses primarily on the growth and well-being of people and the communities to which they belong. While traditional leadership generally involves the accumulation and exercise of power by one at the “top of the pyramid,” servant leadership is different. The servant-leader shares power, puts the needs of others first and helps people develop and perform as highly as possible. Larry Page demonstrates his dedication to this type of philosophy in the section of the letter where he describes Sundar Pichai, the new CEO of Google. He says “I have been spending quite a bit of time with Sundar, helping him and the company in any way I can, and I will of course continue to do that.” Then later when describing all the CEOs of their business lines “In general, our model is to have a strong CEO who runs each business, with Sergey and me in service to them as needed.” It must be a powerful feeling to know that the CEO of one of the largest companies in history is “in service” to you! We work with companies every day that are small or medium sized (<500 people) that have the speed and bureaucracy of a large company. It’s almost as if they adopt bureaucracy and rigid multi-layered org structures as way to to demonstrate that they are a “real’ company. This recent article by Sam Altman (of Y Combinator) really highlights the benefits of staying nimble and being a “project” instead of a “company”. While I would never call a multi-billion dollar enterprise a “project” Google does have the spirit of flexibility and adaptability that many companies lack. Overall I’m really impressed by Google’s switch, by the subtle messages they convey in their letter to investors and I hope that they can hold on to their core values in the long run. The real test will come when Larry Page, Sergey Brin, and Eric Schmidt are no longer leading the charge. Now that we have three kids under four, including one that is only 4 months old, mountain adventures are taking a backseat to playing in the yard and various nap schedules. 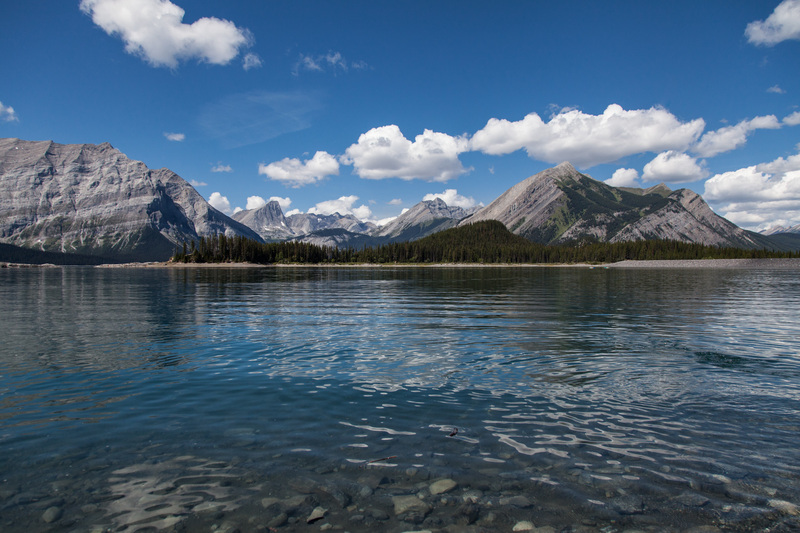 However, we did get out for a nice morning trip to the Upper Kananaskis Lakes area. 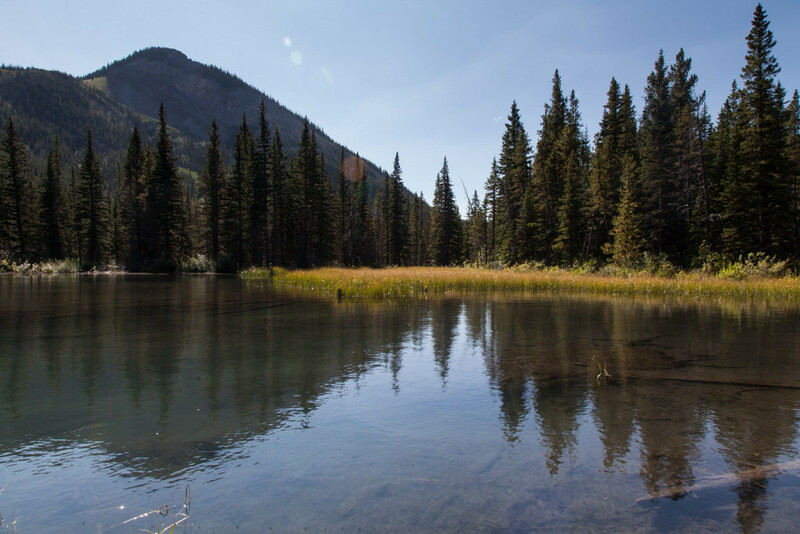 The plan was to hike around the Upper Lakes Trail, and if possible, try and get up to Rawson Lake. From what I remembered of the last time I was on that trail (~10 years ago) it was a fairly smooth and fairly open trail; surely it would qualify as a Chariot Friendly trail. 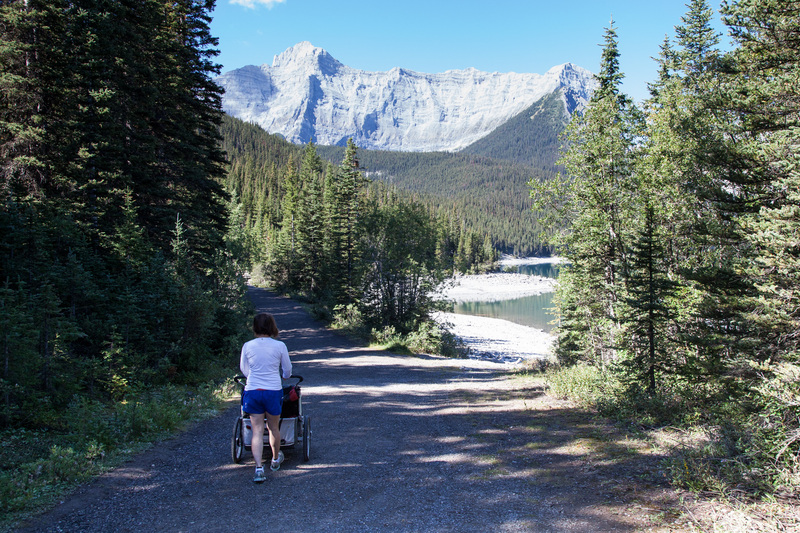 As we started down the Upper Kananaskis Trail it was clear that trail was indeed Chariot Friendly – assuming you didn’t mind lifting it up and over roots, rocks, and ledges. This wasn’t bad with a 4mo old in it I didn’t really mind, so we stoically kept moving along. Next time I think we’d leave the Chariot at home and just use snacks and breaks instead to make sure that the kids can make the trip. 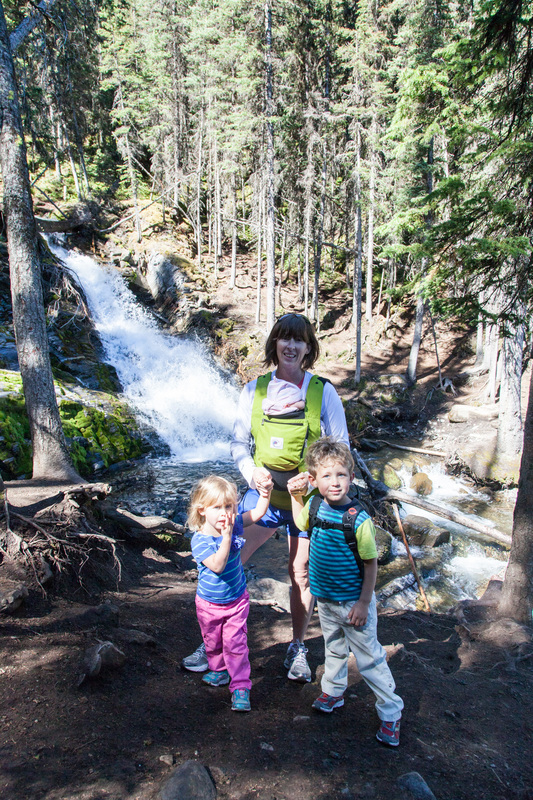 For us, the trail ended at Sarrail Falls ~1km in. The bridge across the creek was wiped out in the 2013 floods and has not yet been rebuilt. We briefly considered continuing, and many helpful people offered to help get our Chariot across the creek, but ultimately decided that was a poor idea. It really wouldn’t do to be on the far side of a creek later on with three kids running out of energy. It’s less stuff that I have to carry! 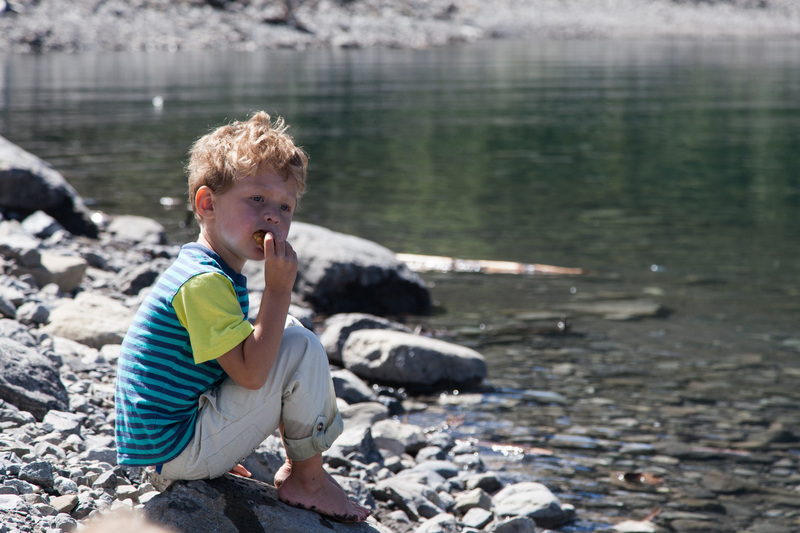 We turned back and went to play at the lake shore while eating sandwiches and trial mix. 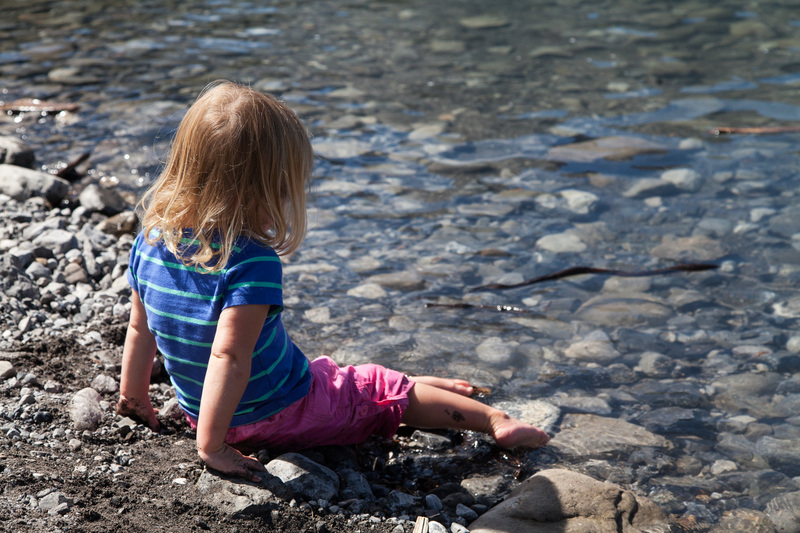 I’m always amazed how much fun the kids have just throwing rocks into the water and generally exploring somewhere new. 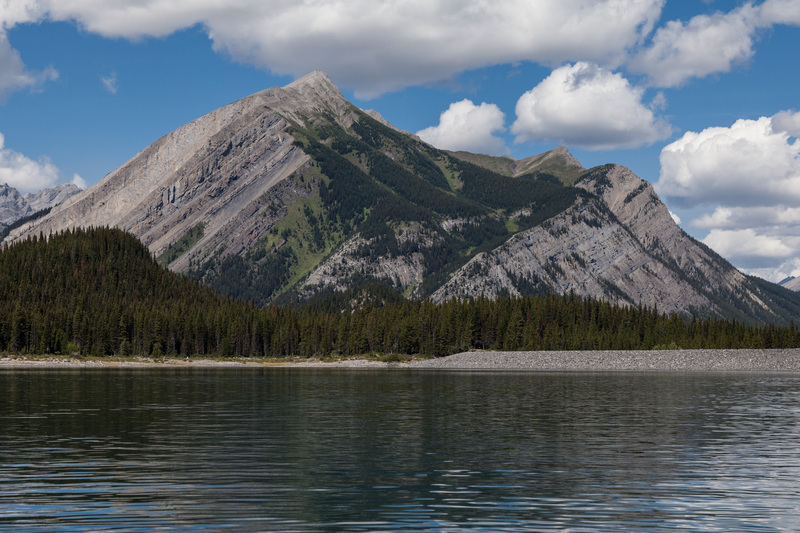 View across Upper Kananaskis with Mt. Lyautey on the left and Mt. Indefatigable on the right. As is our style these days we took off shortly after lunch and let the kids sleep in the car. Since Logan and Riley are both still napping 1.5-2hrs per day this works out pretty well. They never nap as long in the car and I really have to be careful to hit the cattle-gates just right or risk waking them up. I recently had the good fortune to spend a week in Banff attending the 2014 International Snow Science Workshop. The conference was an excellent mix of snow science researchers, practitioners, and industry members and covered a lot of ground including snow mechanics, materials properties, human factors, and of course plenty of time for networking. 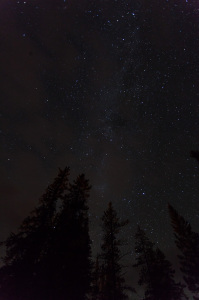 While in Banff I swapped out a night of networking in favour of astro photography. One of my favourite things about doing night shoots is that by their very nature they force me to slow down. 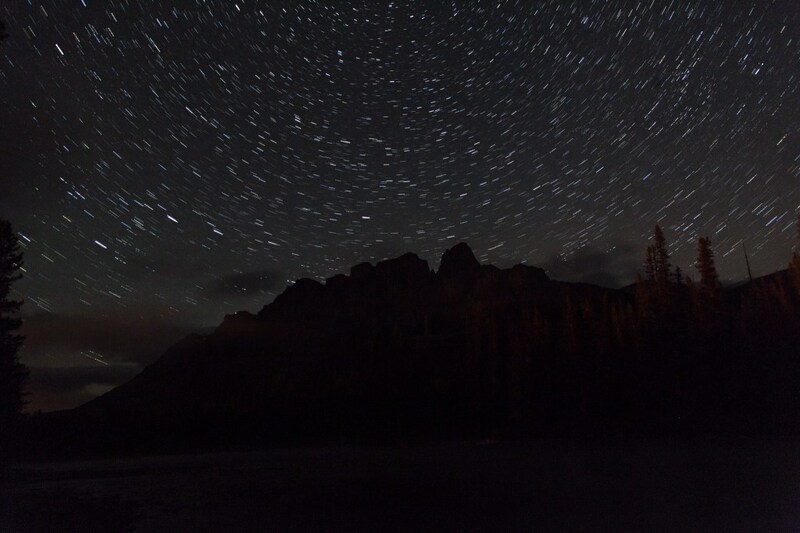 I have found that it takes at least 30min of open exposure to time to get a star-trails image that I’m happy with, any less doesn’t do it, and this is 30min of slow, outdoor, time that I wouldn’t otherwise take. 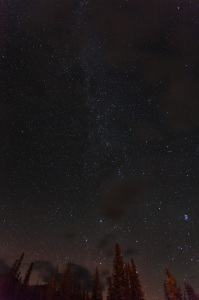 Unfortunately, the night I chose had a few clouds blow in on me and I ended up cutting the session short. I think the images still worked out, and I’d like to go back again for another try. 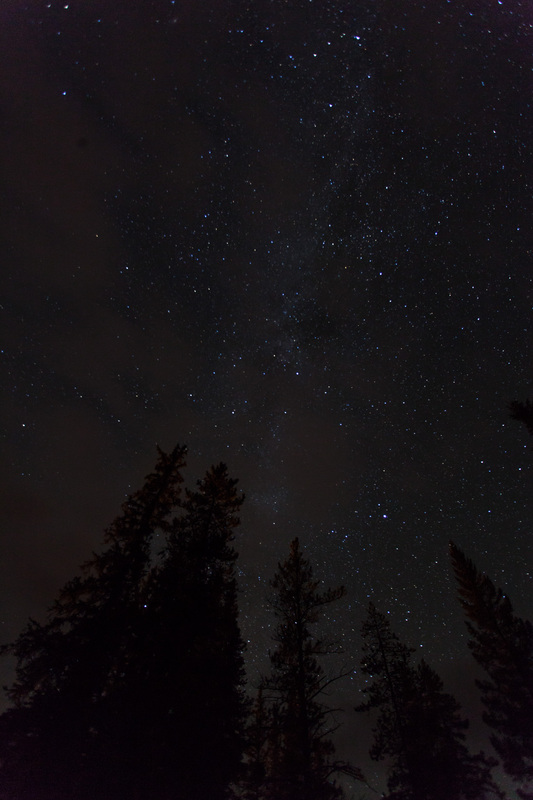 Since the clouds were covering Castle Mountain I re-oriented and tried for some shots of the Milky Way galaxay, another favourite of mine. Unfortunately there were clouds there too. I cycle commute to work as often as I can, and it’s an experience I really enjoy. There is great value for me in starting the day with physical activity and waking up my mind and body. I live in the NW quadrant of the city and work in the SW so the commute works out to about 25km each way, or about an hour of riding time, less if the wind is at my back. Two years ago I upgraded from my mountain bike to a sleek and speedy road bike which decreased my time significantly (~20% I’d estimate) and made the ride more enjoyable. The only downside that I have found with riding road bikes is the sturdiness of skinny tires. I seem to get a ton of flat tires. In the 20 rides I’ve done this year I’ve had three flat tires – I don’t know how many flat tires is “normal” for a road bike commuter, but it probably isn’t 3 flats in 20 rides. In all fairness, the flat tires might come from my own lack of prowess at changing a bike tire as 2/3 flats this year were pinch flats. This morning’s flat tire was was simply poor riding on my part. I was day dreaming about something or other and not watching the road for debris. 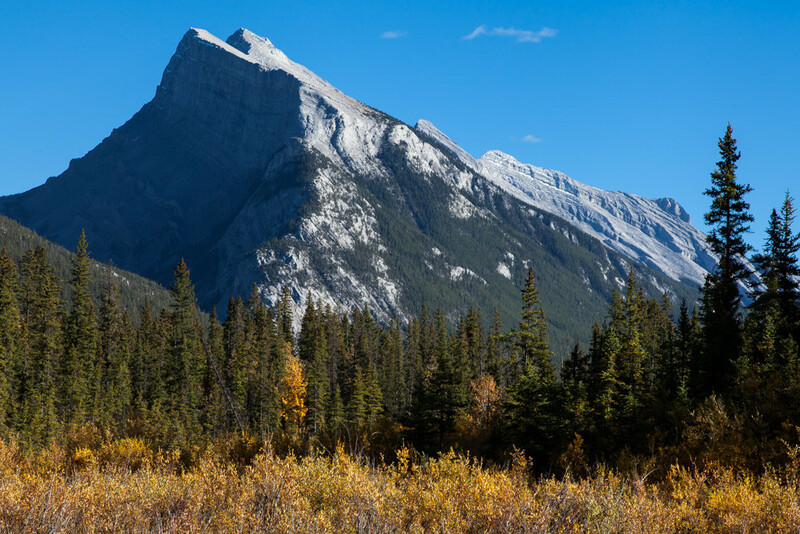 I was zipping along southbound on Home Road heading towards the Bow River when I felt a jolt through the handlebars and heard an unnerving bang. In my day dreaming I hit a rock square-on the front tire and after a moment of wobbling I regained my balance and kept riding. However, only a minute or two later I felt the characteristic sloppy feeling of a flattening tire and had to pull over right where Home Road joins the river pathway. As you can guess I’m pretty good now at changing tires on the go (excepting the pinching part…) and I was taking the front tire off when the first cyclist rode past me. He called out “hey, do you have everything you need? Are you ok?” I called back a quick “yes” and he was on way again riding in to work. My flat happened right near a popular bike-and-ride parking lot and there was a steady stream of of riders passing me. Many of them slowed down and shouted out a variation of the first guy’s offer of help or gear, and I am always impressed by the helpfulness and generosity of Calgarians. This aspect of helping one another out, of offering up something from own kit for a complete stranger, is something that I really appreciate in Calgary’s cycling culture. It is nice to know that cyclists are all looking out for one another and that there is a support network of strangers with kind hearts willing to help out. To her credit she did have a spare and gave it to me with a smile. I thanked her profusely and she was on her way while I finished up my repair. The reason that giving up your spare tube is a big deal is not the $3 cost for the tube, it’s that you’re giving away your insurance policy. If she had a flat on the way home she’d be in a bad way because she chose to help out a stranger, and yet many cyclists in Calgary willingly offer up their insurance policies to strangers. The other time I had to accept help I remember telling the guy that I’d find him the next day and get him his tube back, but he just laughed and said “don’t worry about it, just pass it on to someone else”. 2019 © JourneyingJon. Crafted with love by SiteOrigin.